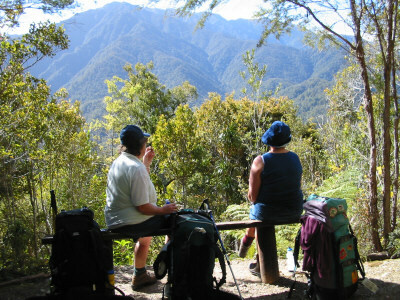 The Heaphy Track is one of New Zealand's most popular Great Walk. 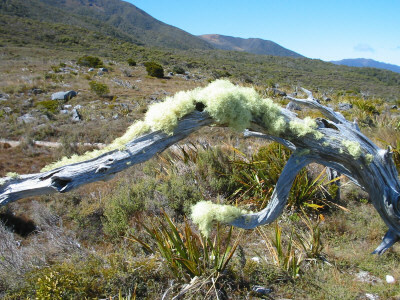 Situated in Kahurangi National Park traversing the remote top western section of the South Island. Each day is rewarded unbelievably by scenery better than the previous day. Ending dramatically with the coastal section passing through pristine Nikau Groves. One of the best times to walk this track is Autumn or Winter. 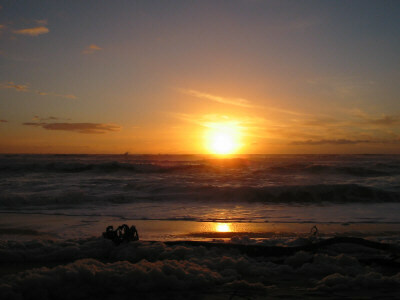 Although the days are shorter and colder. The weather is more settled without the large crowds. 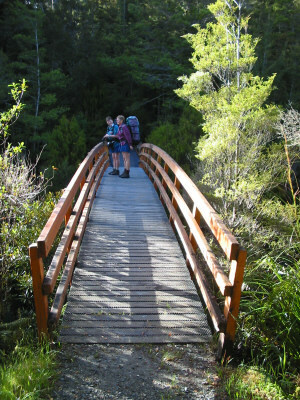 We suggest staying at least one or more nights in Karamea which has plenty of affordable accommodation available. We can transport you straight from the track back to Nelson or Picton. But you will feel a lot more relaxed with the pleasure of a good bed, hot shower and great food. This makes the 6 hour plus transport back to Nelson or Picton a more pleasurable experience for yourselves. Looking for something more challenging after this tramp/hike. 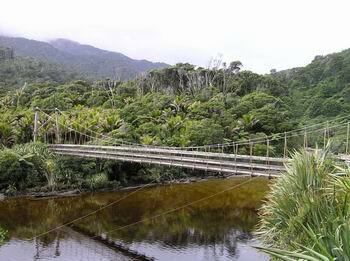 Why not return to Nelson via the Wangapeka or Leslie Karamea Tracks. We can offer you transport options from these track ends. Click on the Links below for more detailed information on these tracks. 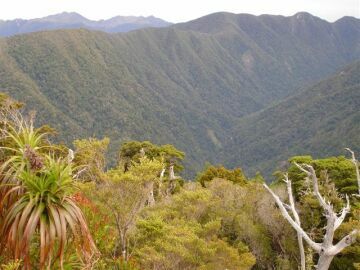 The Heaphy Track can be walked in three days. 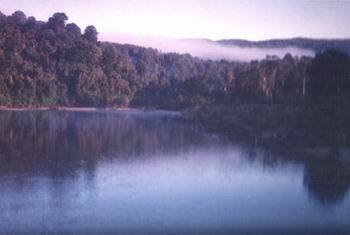 But to really enjoy the scenery it offers I would recommend five or more days. I’ve tramped it at least five times and the most enjoyable trip took seven days. I’ve even cycled the track by myself on our honeymoon (lucky I have a understanding wife and it was the last time you could cycle it legally). 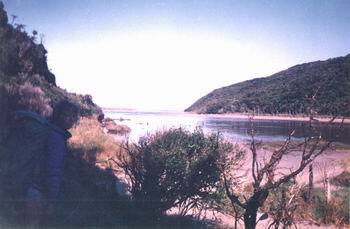 The track has improved over the years and the waist deep mud holes on the Gouland Downs have long since disappeared. Believe it or not people have disappeared on this track and no trace ever found of them. So please keep to the track. Most people tramp the track from East to West. The reason being that Brown River Hut is only 5 minutes from the track end and it’s supposed to be easier. But I have my doubts and we are planning a return trip very soon to prove this theory wrong. The walking times given for this track are generous because I believe in telling people longer rather than shorter walking times. This way they don’t run out of daylight and have more time to explore their surroundings. It’s a good 3 hours shuttle trip from Nelson (Longer if we stop for lunch) and it’s probably a good idea to stay the night at Brown River Hut. Sometimes the fords on the access road can be flooded which adds a couple of hours walking time. Even though Brown River Hut is close to the road end it’s still comfortable and Fortunately doesn’t suffer too much vandalism. The hut sleeps 20 and there is a public phone available. 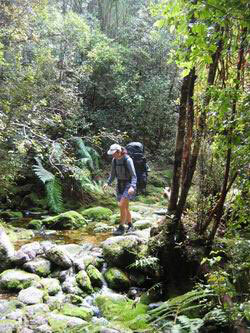 Shortly after leaving Brown hut the track crosses the impressive Brown River and then starts the long but not too steep climb to Perry Saddle through mature forest. 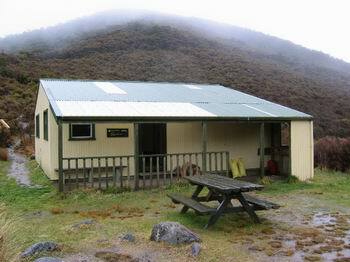 About three hours up the track is the Aorere Shelter. This is a perfect spot for lunch or even spend a night. On a clear day the views are wonderful. You can even spot Mt Egmont on the horizon. Perry Hut is another two hours walk from the shelter and along the way you pass another view point called Flanigans Corner which happens to be the highest point of the track. From hear you can get views of Mt Olympus (Lord Of The Rings filming location and the impressive "Drunken Sailers" Perry Hut is very comfortable and sleeps 26 in two separate rooms. If you have the time climb Mt Perry for those extra good 360 degree views. Hey it’s all down hill from here (well nearly) this section has to one of my favourites. Especially when the late afternon sun catches the red tussocks in the soft light and of course there’s the old boot tree. 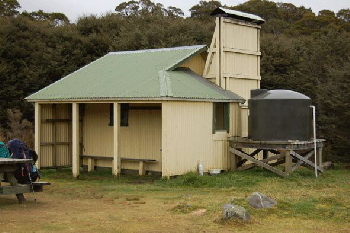 Gouland Downs Hut sleeps 10 people and is one of the old classic huts, which are fast disappearing. There are a number of Kiwis in this area. So keep your ears and eyes open at night. The limestone formations around the hut make interesting exploring in caves. 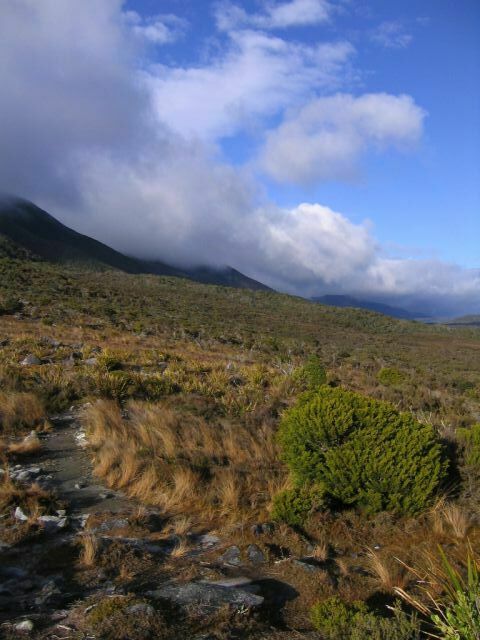 The track passes through more red tussocks and patches of beech forest. Then crossing the Mackay Downs to the Mackay Hut. This section can be tricky in high flood conditions and it’s advisable to sit it out until it’s safe to continue. Normally the rivers come up and go down just as fast. The Mackay Hut sleeps 26 beds and is supposed to be haunted. When the wind howls out side at night and the mist whips past the windows you could almost believe this story. 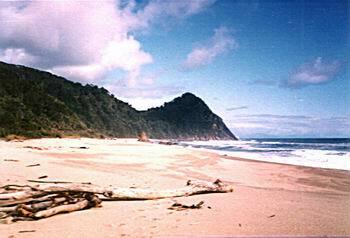 From here you get good views of the Heaphy River Mouth and the Tasman Sea. 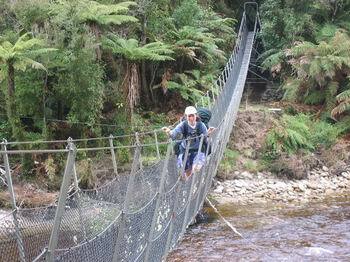 Shortly after leaving the Lewis Hut you cross the Heaphy River.In low river conditions you can cross the Heaphy but it's a lot safer to use the swing bridge.After heavy rain the river can be wild and dangerous.The track stays on the true left all the way down to Heaphy Hut. Passing through mature Rimu,Rata and Kahikatea forests.The best thing of all is that the track is mainly flat with little or no hill climbing.The only other major river to cross is the Gunner River which has a swing bridge.When I cycled through the Heaphy I managed to lose my new $800 sleeping bag while carrying my bike across the swingbridge.My instant thoughts were of my new wife divorcing me because of my stupidity.I dumped the bike half way across the bridge and ran back to the river bank(no easy feat on a swing bridge)Just managed to retrieve the bag before it floated into the Heaphy River.The Heaphy Hut is set back from the beach and is well protected by the off shore winds.The hut can sleep 30 people with plenty of camping outside.If you have the time to spend an extra day there's a lot to explore.Wander down to the beach just before sunset and experience some of the best sun sets you will ever see. 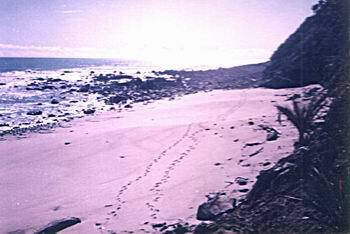 This section is mostly flat and keeps mostly in the forest.There are times when you can walk along the beach but be very careful of Crayfish Point.A few trampers have been washed away by rouge waves in the past.It is only safe to cross here two hours each side of the low tide. 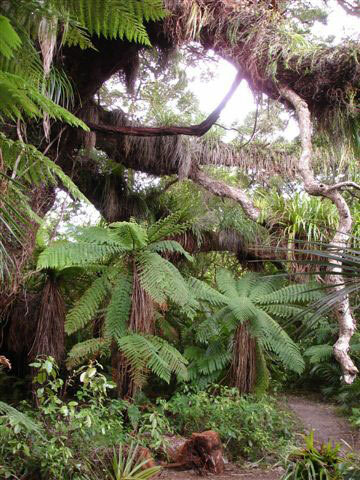 DOC have now built a high tide track which involves a small climb but is the safer alternative (This track is closed at the moment.Click here for the Crayfish Point tide table) There are plenty of places to stop for lunch amongst the many Nikau Palm groves. 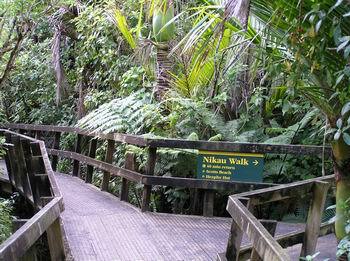 Some of these Nikau Groves are thought to be about 900 years old. They only put out a growth ring once every 25 years.The only other thing to worry about is some of the unbridge side streams. 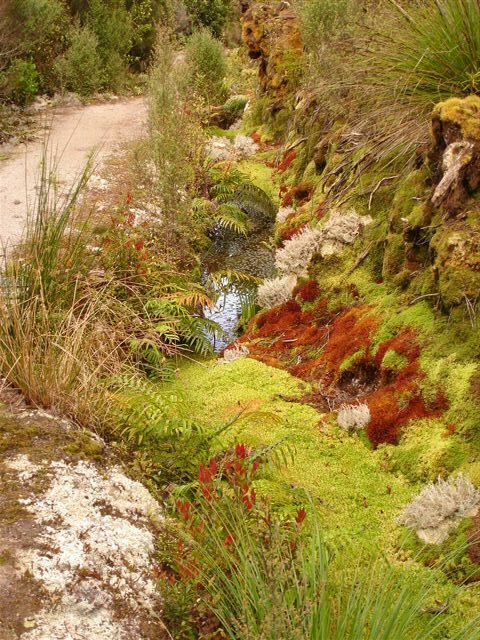 Although harmless in normal flow conditions, they can be very dangerous to cross after heavy rain. Scotts Beach offers a nice beach walk giving you a good view of the Kohaihai Bluffs.The track then climbs over the Kohaihai Saddle and then drops down to the Kohaihai swingbridge.Then it's only a five minute stroll to the track end. 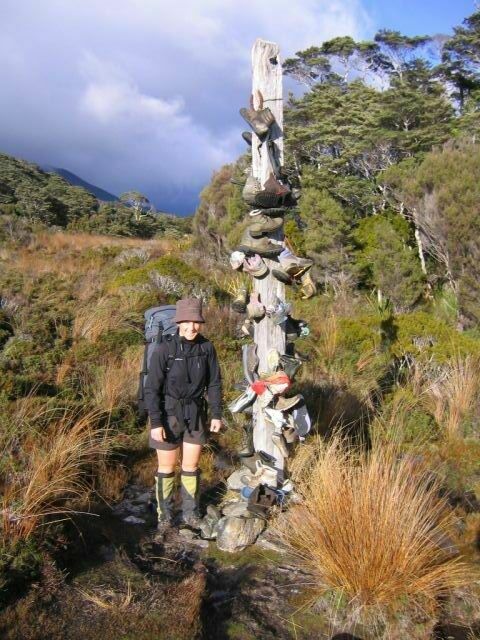 Some people prearrange Nelson Lakes Shuttles to pick them up from here or your accommodation in Karamea. If you have a couple of spare days there's plenty to see & do in Karamea.The Honeycomb Caves, Fenian Track and Oparara Archs are a must. 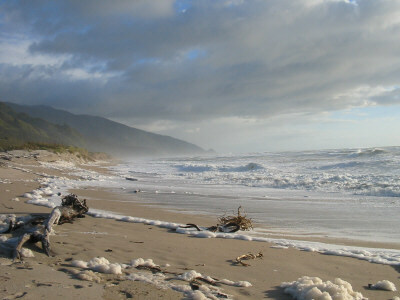 Rental cars can be hired in Karamea for you to explore these areas at your own lesuire. Contact us for hire details.